This year marks the 99th anniversary of one of the most momentous events in Irish history – the 1916 Easter Rising. The insurrection and the executions that followed transformed the political landscape in Ireland. Within three years of the Rising the Irish people had rallied to the Republic, leading to the establishment of the revolutionary Dáil Éireann, the Tan War, Partition and the withdrawal of British forces from the Twenty-Six Counties. The 1916 Rising asserted the right of the Irish people to the ownership of Ireland and their right to control the destiny of the Irish nation. The 1916 Proclamation placed equality and social justice at the heart of a new Irish Republic. Ninety-nine years later and much remains to be done to fulfill the vision contained within the 1916 Proclamation. At 4pm on Saturday April 4th a Citizens Celebration of the 1916 Rising will take place in Dublin City. This family-friendly event is being organised to give citizens an opportunity to honour those who have died for Irish freedom whilst also demanding an Ireland that truly cherishes all the children of the nation equally. Music on the parade will be provided by the Black/Ryan flute band from Glasgow who are travelling to Dublin to participate in the celebrations. It’s expected that the Citizens Celebration will take about ninety minutes in total, finishing up about 5.30pm. A social event with ól, ceol agus craic will follow in Lloyds Bar on Amiens Street. 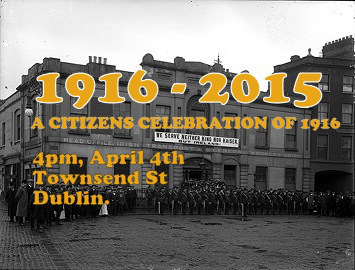 We would like to invite you and your family to join the Citizens Celebration of 1916 on April 4th. Please invite your neighbours, friends and workmates to come along to remember our patriot dead and demand a new Ireland that will put the needs of the people ahead of the greed of the corrupt politicians, bankers, landlords and the rest of the ruling elite. As readers will be aware, as well as doing this site I am part of the collective behind Redline, a great little marxist site based way down in New Zealand. One of the main areas covered by Redline is the struggle for Palestinian liberation and, within that context, the Popular Front for the Liberation of Palestine. A number of us at Redline were engaged a few years ago in a campaign to raise funds for the PFLP. A campaign which, sadly, no longer exists. However, it managed to raise several thousand dollars in its only too-brief existence. The Palestine/PFLP connection also fits neatly with this blog because of the solidarity between éirígí and the PFLP. Indeed, it was an earlier incarnation of Redline which was able to put éirígí in touch with Leila Khaled and the PFLP, although Leila has been banned from entering the twenty-six counties (ironically, she has been able to enter Britain – another case of the neocolonial lackeys sometimes being worse than their imperialist masters!). Anyway, this is a plug for the Redline coverage of Palestinian and PFLP material, as I keep this site for specifically Irish material. We have numerous articles up on Redline on the cause of Palestinian liberation and the PFLP, including an interview that was done with Leila as part of the fundraising campaign. 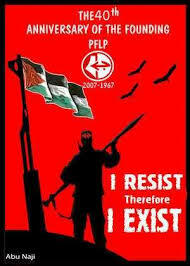 Also, check out the Palestine and PFLP categories on the site. From the Civil Rights Movement to contemporary protests against austerity, the years since 1968 have witnessed widespread and varied social movements in communities, workplaces and colleges throughout Ireland, North and South, that have fought for, and resisted, social change. These movements have spurred the growth of numerous organisations ranging from those advocating limited reform, to those advancing revolutionary change in society. However, despite its immediate relevance to an understanding of contemporary Ireland, the lack of historical research conducted in the agents and resisters of social change since 1968 is a noticeable gap in the study of class and politics in Ireland. This interdisciplinary conference hopes to address this. We welcome scholarly contributions of 20 minutes from established academics to students on any issue that falls under the remit of the conference title. The conference also affords us the opportunity to preserve and generate sources for the benefit of future researchers. We hope to offer workshops on oral history and the preservation, including digitisation, of documentation such as leaflets, posters and periodicals. To this end, we especially want to hear from activists in movements and organisations from the period who may be interested in sharing their experiences and documentation in a friendly and open environment. If you were/are an activist in this area and are interested in attending, please let us know at the same address by the same date. We would be especially grateful if you could inform us if you are willing to share your experiences as part of an oral history interview and/or have documentation which would be of interest. All documentation will remain the possession of the owner.